T1V creates interactive experiences for retail, events and exhibits, corporate, hospitality, and education markets around the globe. From brainstorming and strategy phases, all the way to custom hardware and software development, final installation and ongoing support – T1V’s collaboration with customers spans the entire lifecycle of the product. T1V’s products are incredibly durable, scalable, and cost-effective, and are built to withstand the test of time (or, lots of human interactions). T1V’s patented software is designed for multitouch, multiuser, and multiapplication use – enabling multiple people to simultaneously share and operate across the T1V Interactive Platform for more connected, digitalized, and engaging experiences. All T1V Interactive touchscreen Tables and Walls come with a package of standard software features and applications, with the option to build your own custom software. T1V’s Interactive Walls transform public spaces into more dynamic environments. 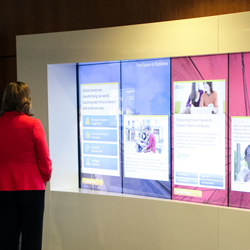 Deliberately large in size, these touchscreen Walls are designed to leave an impression on not just a handful of people, but an entire audience. 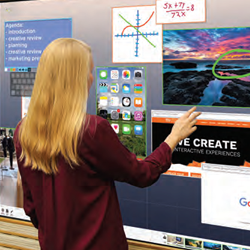 The touchscreen can be split into separate active areas – allowing for people to interact collectively or individually.